A nice day out.........followed by a drink on the terrace or in the lounge with fire place, a lovely dinner, and a good night's rest. Sleep well on a Boxspring bed, made up with quality linnen in order to start the day afresh. What more do you need? These rooms are located in the 'new build' part of the hotel (May 2012). Not all rooms are equipped with balcony or bath tub. You can indicate your preference, depending on availibility or at extra costs. Would you like to reserve a double or a twin bedded room? Don't hesitate to inform whilst reservering. Your room is available from 15.00 o'clock. Should you arrive later then 20.00 o'clock, please inform us beforehand. Check-out is between 8.00 and 11.00 o'clock. Rooms are equipped with shower and toilet. Renovated in 2010. No space for adding an extra third bed. 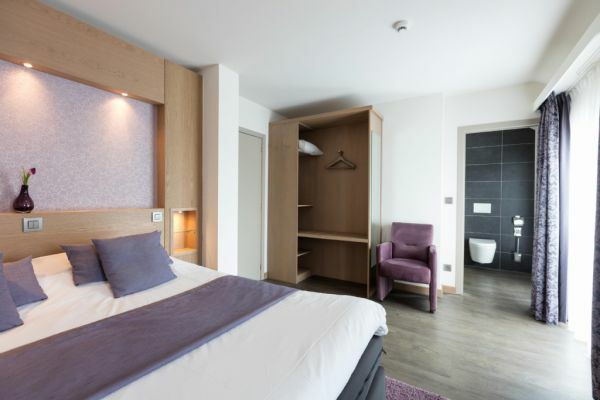 Would you like to reserve a double or a twin bedded room? Don't hesitate to inform whilst reservering. Pets are allowed at an additional charge of € 10 per night.